It’s no surprise that the Easter season in Jerusalem is full of concerts and events to celebrate the resurrection of Jesus. Simultaneously, Passover also falls during this time of year, so festivities fill the streets, venues and holy sites. One event that stands out in the midst of both of these faith traditions is one that took place at the West Jerusalem YMCA on April 6th. 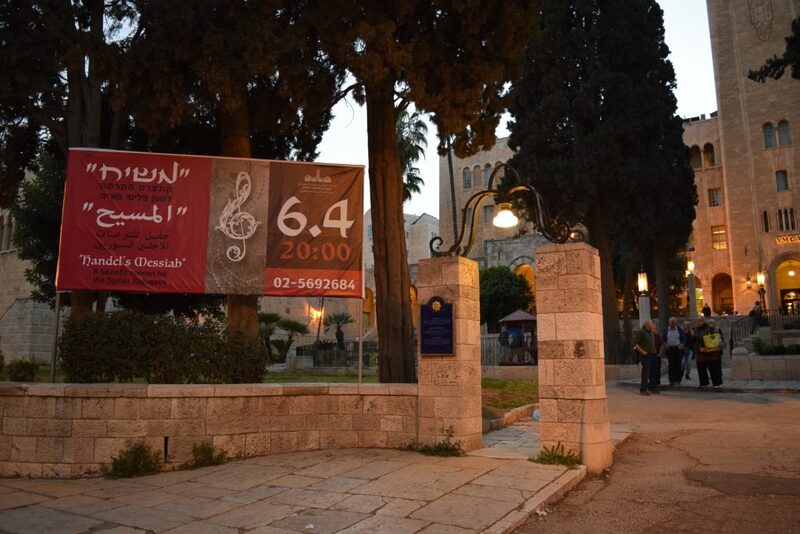 Musalaha, a non-profit organization in Jerusalem that promotes and facilitates reconciliation between Israelis and Palestinians based on the life and teaching of Jesus, organized an event which brought together those that may not usually gather for a charitable benefit concert for Syrian refugees. 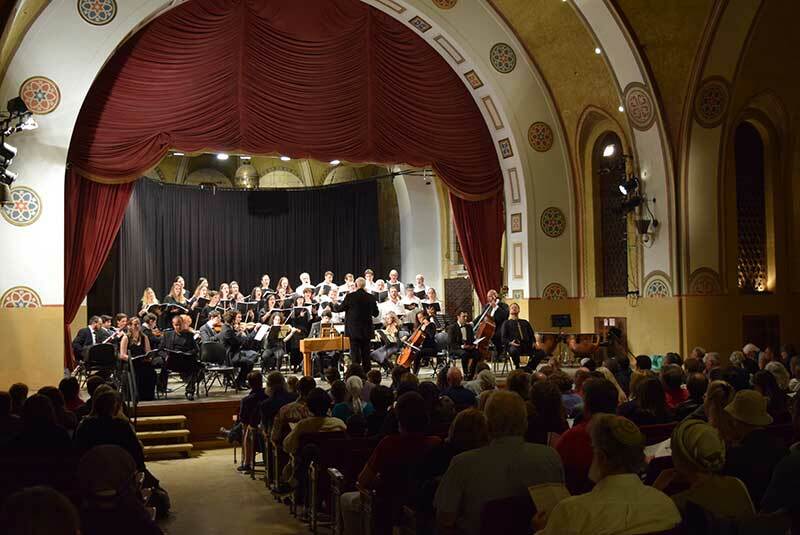 Musalaha organized the event hosted by the West Jerusalem YMCA which featured David Loden conducting a choral performance of Handel’s Messiah in Hebrew. Hoping to bring together people who typically don’t work together, this event was set in motion to do just that. The proceeds were to be given to the upcoming trip(s) to Jordan by the students of Bethlehem Bible College for the refugee populations they work alongside. Handel’s Messiah is an oratorio that was composed in England in 1741. Originally in English, this production of Messiah was in Hebrew. Director David Loden’s choir of mostly (though not all) Messianic believers beautifully performed the oratorio for those in attendance. Musalaha not only saw this as an opportunity for unity and solidarity, but also for those who have never heard the story of Jesus in their own language in a non-threatening, beautiful manner. The oratorio was masterfully conducted and performed by the talented Loden and his choir, who have, in previous occasions, performed for benefit concerts. 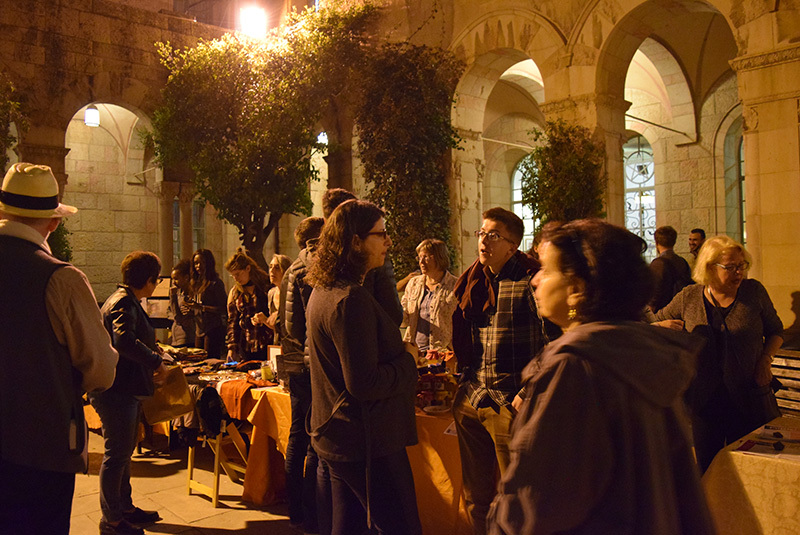 Upon my arrival at the event, people from various backgrounds and walks of life filled the courtyard area mingling and browsing the tables of merchandise where a portion of the funds collected were to be donated to the night’s overall earnings that would be given to the refugee ministry. Taking my seat in the auditorium, I was surrounded by familiar faces from Bethlehem Bible College, Musalaha, my local church in East Jerusalem and friends from both Bethlehem and the Jerusalem area. Among them were many faces I didn’t recognize, but as is somewhat commonplace in Jerusalem, people’s dress betrayed their identity, and I noticed several Orthodox Jews throughout the crowd. Others in attendance were internationals, Palestinian Christians, Messianic Jews and many others from the area that wanted to partake of an evening of entertainment all the while supporting refugees. Having sold just over 300 tickets, the auditorium was nearly full, and judging by the comments of those in attendance that I heard after the event, it was a large success. It was refreshing to see so many people of differing backgrounds, ones that often don’t see eye to eye about the current situation in this region, coming together for a night of solidarity for the refugees of Syria. In a place where division is rampant and segregation takes form in both societal structures as well as physical barriers, this event highlighted a moment of unity. In an evening devoted to bringing to the forefront a humanitarian crisis facing our world today, people from many walks of life joined together in solidarity to express their care for those that have been neglected in our world today. It was a breath of fresh air to see a level of unity in addressing an issue of injustice, even when the ongoing situation in the Holy Land persists. Perhaps with this kind of positive engagement and proactive planning, we will begin to see these kinds of meetings continuing and leading to opportunities for reconciliation in our own context. As the famous line in the Messiah oratorio exclaims, “Hallelujah!” indeed.